KANSAS CITY, Mo. 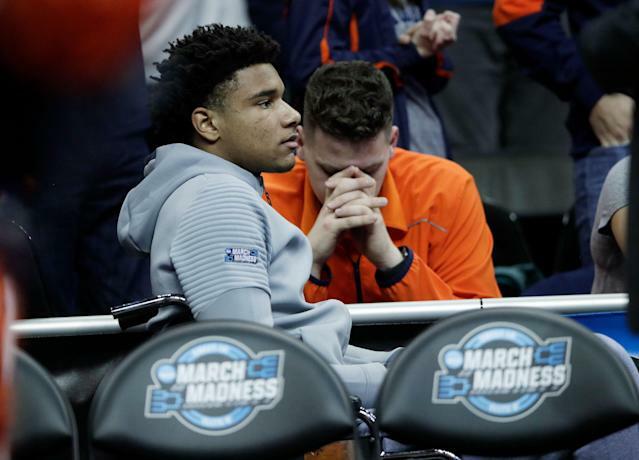 — Auburn’s celebration couldn’t begin without injured forward Chuma Okeke. Moments after the final buzzer sounded after No. 5 Auburn’s 77-71 overtime Elite Eight win over No. 2 Kentucky, the entire Tiger team swarmed toward Okeke, who had been stationed in a wheelchair behind the bench. Chants of “Chuma, Chuma” broke out among the Auburn faithful celebrating their school’s first Final Four appearance. Okeke, who suffered a torn left ACL in Auburn’s Sweet 16 win over North Carolina, wasn’t initially expected to make it to the arena. His teammates took to the court earlier Sunday afternoon with no belief that Okeke would be in attendance. The Tigers were trailing by five at halftime when they got the news from coach Bruce Pearl that Okeke would be coming to the game after all. “That goes to show how great of a teammate he is, honestly, for him to show up, knowing how much pain he was in,” Samir Doughty said. And, according to Brown, Okeke’s presence gave Auburn a boost. Those same “Chuma, Chuma” chants first started in earnest when Okeke was wheeled toward the bench during the first television timeout of the second half. “I just wanted to dap him up and encourage him,” Brown said. The lift from Okeke started before he got near the bench. The Tigers flipped what was a 35-30 Kentucky lead into a 42-39 advantage in the four minutes between finding out he was going to be at the game until he got to the bench. Brown had scored eight of those 12 second-half points. Five came in a manic sequence where he made two free throws, missed a third but stole a pass from Kentucky’s P.J. Washington after the rebound and immediately drained a three to turn a two-point Kentucky lead into a three-point Auburn lead. Okeke had scored 20 points in Auburn’s 17-point win over the Tar Heels before he went down in a screaming heap with just over eight minutes left. His shouts made it clear that he had suffered a serious knee injury and a Saturday MRI confirmed the team’s fears that he had suffered a torn ACL. Surgery is set for Tuesday. Pearl called the win over UNC a “bittersweet accomplishment” because of the injury to his team’s most versatile and valuable player. After the news of Okeke’s injury was official, ‘Do it for Chuma’ became the team’s rallying cry. Malik Dunbar wore Okeke’s No. 5 jersey during warmups. There was a little more added motivation Sunday morning too. A picture of a banner from, presumably, Kentucky fans mocking Okeke made the rounds on social media. Auburn’s players took notice. While Brown gave Auburn a lift to start the second half, he needed some help. Enter Harper. The two guards combined for 23 of the team’s 30 second-half points. Yet neither player took the potential game-winning shot at the end of regulation with the game tied at 60-60. In overtime, Harper took over. He scored 12 of Auburn’s 17 points in the final five minutes. As Kentucky’s defense focused on taking the three-point shot away from Auburn, the quick point guard was able to make his way to the basket over and over again as the Tigers pulled away. “I know that they couldn’t keep in front of me and they weren’t helping too much so I just knew that I had to get to the basket and look to finish,” Harper said. Harper finished with a team-high 26 points. Brown had 24. No other Auburn player had more than eight. As the Tigers took to the stage to receive the trophy for winning the Midwest region, Okeke wasn’t able to join his teammates on the platform because of the injury. He watched his teammates on the platform above with orange and white confetti sitting on top of his left shoe and the large black splint that braced his leg. He was still a big part of the festivities. As his teammates were handed a bracket to place the school’s name into the Final Four, everyone called out for Okeke to place the sticker bearing Auburn’s name like he had Friday night. And when the trophy was given out, Okeke was one of the first people to get the chance to hold on to it. The first of the two nets that were cut down also went to Okeke. He slipped it around his neck. While teammates climbed ladders, exchanged hugs and laid down in the confetti strewn across the court, Okeke was the most popular person on the court as seemingly everyone in sight wanted a picture. “It felt good to see him out here smiling,” Dunbar said.